Aruba’s climate is classified as a semi-arid tropical marine climate, with little variation in temperature from season to season. And while most of us that move to Aruba come here for the endless days of sunshine, the lack of consistent rainfall (we average about 18 inches or less a year), wind, and salty air present challenges for a healthy garden. I have been a homeowner in Aruba for ten years now, and through trial and error, I have figured out which plants are happiest in my garden on one happy island. In this post, I will highlight flowering plants and shrubs that love lots of sun, are drought tolerant, and don’t need an overwhelming amount of care. Popular in the Mediterranean and Mexico, and native to Brazil, this thorny, vine-like plant has brilliantly colored, showy blooms in a variety of colors (my favorite is hot pink). They can be trained as a creeping vine to crawl up a trellis or fence, can be pruned as a shrub, or left to their own devices, they can grow to tree-like size. They prefer full sun, well-drained soil, and not much water. for groundcover, borders, and even potted for your patio. My vincas are constantly flowering—I have soft pink, white, and magenta blooms, but there are many color varieties. They embrace the sun and like well-drained soil. I water my vincas three times a week. I have 5 hibiscuses—three different varieties and various colors. They are sun-loving but require enough water to keep the soil moist but not too saturated. These plants will reward you with lush, trumpet-shaped blooms. Bonus: butterflies and hummingbirds will frequent your garden to sip the nectar of the hibiscus. Another butterfly and hummingbird magnet is this plant that is ideal as a border or planted in a pot. Dark green leaves mingle with clusters of tiny, colorful flowers. This low-maintenance plant needs moist, well-drained soil and can tolerate full sun, however my pentas seem to thrive in a part sun/part shade environment. The lush greenery and fragrant, white blooms of this plant will add an exotic feel to your garden. A bit of thought should go into placement, as they do like full sun, but just a few hours a day. Keep the soil moist (I water mine every 2 to 3 days). They can be trained as a shrub or, when pruned correctly, can grow up to 15 feet. This evergreen is a climbing plant with richly colored, trumpet-shaped blooms. They love our warm climate, but partial sun or filtered sunlight is best. I have one on my patio that receives about 4 hours of direct sun a day, producing gorgeous crimson red blooms. Contrarily, I have two in my yard that I am trying to coax up my back wall (I string some chicken wire along the wall to give them something to climb), but because they are in direct sun most of the day, they do not grow or produce blooms as well as the one on my patio. I lived in North Carolina for many years, so I was thrilled (and surprised) to see a few small crepe myrtle starter trees for sale at Fantastic Gardens last summer, as I have never seen this tree on the island before. I had to water it almost every day for the first three to four months, but eventually it “took” and has grown from about two feet to over 10 feet in less than a year. This evergreen shrub produces delicate, colorful blooms almost year-round. The plant, which can grow to close to 20 feet, is drought tolerant, thrives in full sun, and likes well-drained soil. I water my oleanders twice a week, although I know many friends on the island that only water once a week. *Aruba’s soil is not exactly nutrient-dense, so I fertilize most of my plants once a month. 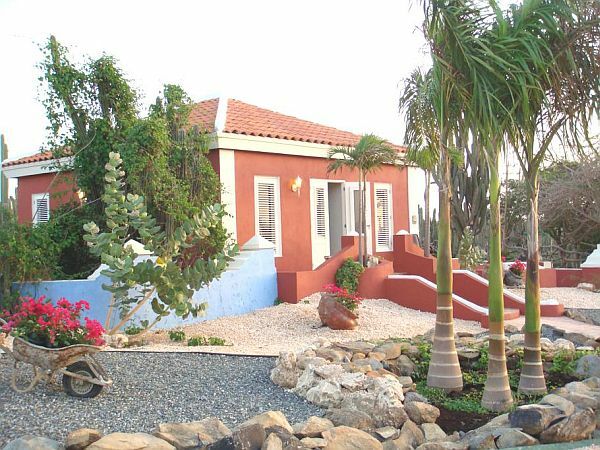 There are many more plant species that do well in Aruba’s climate, but those discussed here will surely help boost the bloom factor within your landscape!